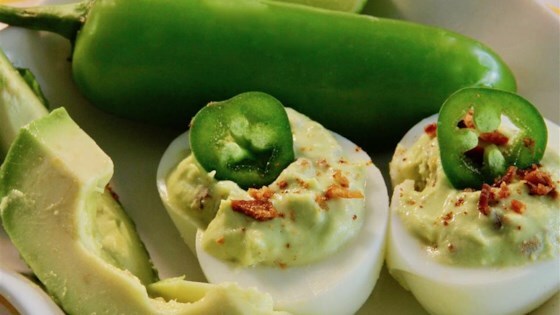 "This is a twist on the traditional deviled egg. I usually use 1 or 2 fewer yolks for the filling." Scoop egg yolks into a bowl; add avocado, 2/3 of chopped turkey bacon, mayonnaise, lime juice, garlic, cayenne pepper, and salt. Mash egg yolk mixture until filling is evenly combined. Spoon filling into a piping bag or plastic bag with a snipped corner. Pipe filling into each egg white; top with a turkey bacon piece, jalapeno slice, and dash hot sauce. What a nice twist to the deviled egg!!! I had to make a day ahead so I put the filling in a plastic bag, squeezed out the air and filled egg shells the next day. I didn't have mayo or bacon and they were still great! I used more avo in place of the mayo, and then smoked paprika on top. Delicious! Used the same recipe. But added sriracha and wasabi sauce. Paprika for color. Came out really good.